I can’t remember a time when I wasn’t dreaming about travel. We traveled across country with an RV when I was growing up – back when gas was cheap and no one was thinking about climate change or sustainability. I looked forward to those summer vacations and the exploring we would do. We visited national parks mostly, but we also enjoyed many state parks and even cities and amusement parks. My love of travel started at an early age. As I grew older, I started to think about my own adventures. When I was 16, I decided to live abroad and spent a year in what was then West Germany as an exchange student. This year was one of the best of my life. Not only did I learn to speak German, I also immersed myself into a new culture and had the opportunity to really explore. I used the wonderful rail system to travel not only through Germany, but throughout western Europe. I caught the travel bug, and I’m still infected. I’ve traveled to Europe several times, and I’m always dreaming of the next trip. I also can’t remember a time when I didn’t love trains. My mother says the first sound I recognized as a baby was a train whistle. I begged and begged as a kid to ride every steam engine I learned about. When in Europe, I completely fell in love with rail travel and the freedom, time and beauty it provides. Now, I board Amtrak whenever I can. To me, there’s something about a train that just makes me smile. I discovered cycling later in life on a fabulous trip to Italy. Wanting to take a vacation and having some money burning a hole in my pocket, I decided to take an active vacation. I booked a cycling vacation in Italy, and I rode from Venice to Florence. This trip really changed my life in many ways. 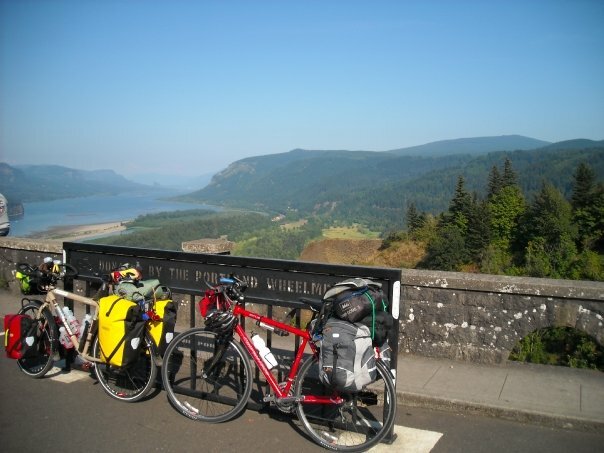 I discovered another amazing way to travel – by bike! I saw places I wouldn’t see by train or by car. Because I was traveling slower, I had the chance to meet the people in the places I visited. I fell in love with cycling so much, I started riding for fun and riding to work. How does this all fit with Greenward Travel? I care deeply about our planet and the people who on live on it. I want to help us move towards living in a more sustainable so that we protect the planet and all living things and beings on it. Travelling can also connect us with cultures, people and nature, which helps us see all the beauty on this planet. I want to experience travel in a way that protects the earth and honors its cultures. I want to find more ways to ride and to walk while traveling. More importantly, I want to share what I learn, so that we can all experience travel in a sustainable way. Greenward Travel is partly a blog, partly a travel resource, and partly a travel agency service. It’s a collection of my research, my stories, and my favorite trips and vendors. It’s my way of sharing what I’m learning about traveling green and sharing the joy I experience while traveling. To share my dream that green and sustainable travel can be fun, easy, and rewarding by exploring the world and its cultures through bicycling, walking, rail and other methods of sustainable travel. To provide fellow travelers with friendly and outstanding service and helping them plan memorable and fun personal vacations that match their lifestyles and fit their budgets. To honor my commitment to creating a greener world by operating Greenward Travel using sustainable business practices. I believe we have richer lives if we explore the world using a sustainable approach to our travels. By getting to know our world, both locally and afar, through slower and sustainable methods, we experience a more rewarding adventure that connects us with nature, the culture, and the people we visit. By letting our values guide our travel choices, we can help preserve the beauty of the Earth and all people and living things that call it home, while enjoying some of the best adventures of our lives. Greenward Travel is based in Portland, Oregon. Greenward Travel operates as an independent agent of Travel Quest.